Blender is a great test but in many cases can be more frequency dependent than seeing the benefit of the two extra cores the 7900X employs. This shows itself in a longer finish time for the CPU by approximately 2.5 seconds. Cinebench is probably the go-to as of recent as far as testing CPU performance. Here it once again allows the 7900X in the X299 Creation to flex its collective muscle. 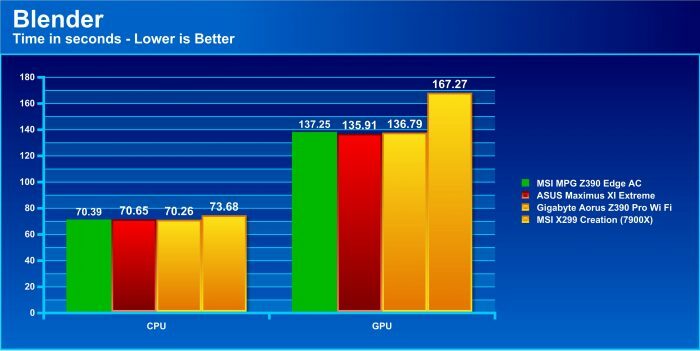 Pulling clearly ahead in the multi CPU benchmark, while losing some ground in single. The single thread benchmark is 1:1 which means the 9900K will beat it all day. Handbrake is a good test for those looking at video encoding which is becoming a much more common task as more people are now playing with digital video. Handbrake also happens to be an AVX load which of course means torture for a CPU and VRM. 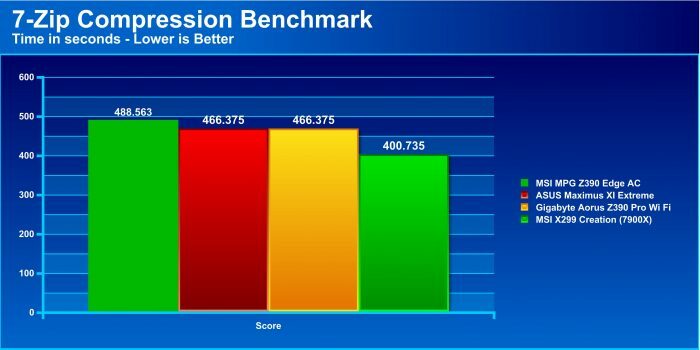 Here we see once again frequency is king in this benchmark as the 9900K with higher frequency and absent two cores still pulls ahead. The 7Zip benchmark shows the compression capabilities of the platform. 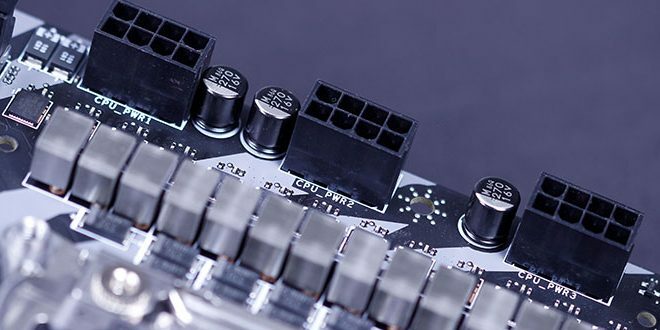 Here once again we get a core friendly bench which allows the 7900X shine and it does so with about a 12% performance gain over the Z390 mainstream platforms.